Pinterest is one of the most popular social media sites out there- and believe me- it is one of the most addictive! How can we tap into a traffic source where millions of (mostly) women with expendable incomes are scrolling through pins and repins to scratch an itch they have? They may be planning a birthday party, finding the perfect playhouse or nursery decor, or finding recipes for the most appealing, lowest calorie chocolate treats. You name it, there are pictures on pinterest. And the pictures share links! Share informative articles- Be sure to have top quality images to share your informative articles. Infographics do great. So do lists like “5 Ways to make money with pinterest traffic” 🙂 Use keywords that people are searching for in your titles. Note: Images that are reddish-orange get twice as many repins as blue images. 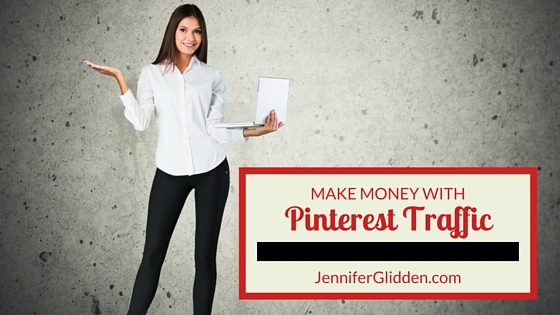 Promote Pins- this is the paid traffic portion of Pinterest. They have strict guidelines on what kind of pin may be promoted. The goal is to gain conversions through pins, and also have them go viral with repins. Repin popular content to gain more followers- If pins are already really popular, pin them to your board and add notes (or links) to drive traffic to your site. As you have more content that people enjoy on your boards, people will start following you. At that point, you can pin more items and gain more traffic to your site through those pins. Pin your products- if you sell digital or physical products, pin them! Pins have incredible link juice in google and even if your product doesn’t rank on your ecommerce site, the pin may rank and bring more traffic your way! If you have a shopify store, publishing to pinterest is built into the platform. Engage with your audience and encourage repins. Remember that pins are forever! Avoid promoting pricing that may change unless it’s a special offer with a clear end date. Convert your account to a business account so that you can get insight into your pinterest traffic. You’ll be able to see the most popular posts with pins and repins and other data. That’s it! The best way to learn is to get onto Pinterest and start looking around. Create boards with pins that you think other people will enjoy. Start following other boards and engaging in the community. It is a fun platform that has the potential to bring you a lot of business! For more information on ways to drive traffic online, check out my Traffic 101 page. To get more business building strategies and training FREE, join my newsletter here!